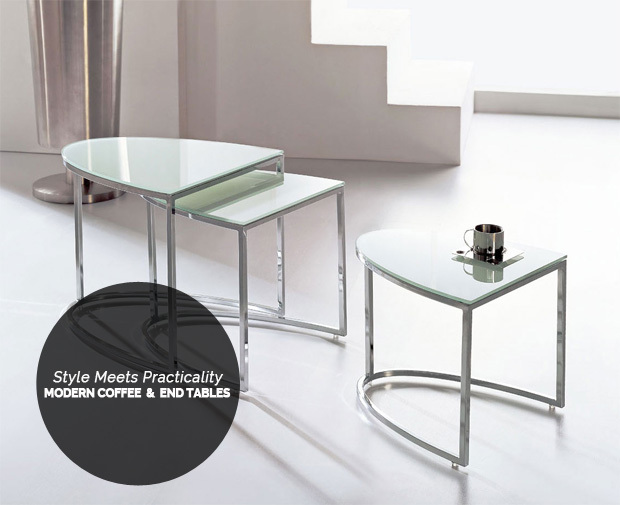 Modern coffee and end tables have to be both stylish and functional. They have to make your home look good, but they also have to do more than just look pretty. We spend so much time in our living rooms that it is important that we have coffee and end tables that can fit where we need them, hold what we need them to hold, and offer convenient access. Sometimes you just want to eat a meal or a snack in front of the TV. But you don’t want to deal with a clumsy lap tray or a dowdy TV table. Instead, you can use a lap side table and just pull it around when you need it. 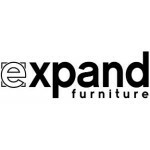 The table is the perfect size to hover over your lap when you are seated, and it has a bent arm that allows the surface to reach you while the base is kept off to the side. 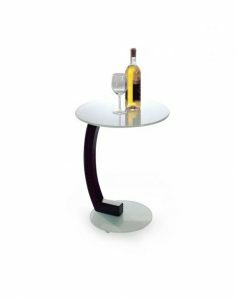 The table is the perfect size for a bottle of wine and a glass or a light snack. A side table next to the couch or an armchair is handy for holding the remote control, a reading lamp, or a pretty vase. But a single side table may not be enough for everything that you want to keep nearby. You don’t want to get a larger side table or get multiple side tables because you don’t want to take up more floor space. Nesting side tables give you more surface area when you need it without taking up more square footage. Nesting side tables stack inside each other, just like the old nesting dolls. Each table is just a bit shorter and smaller than the one before it. 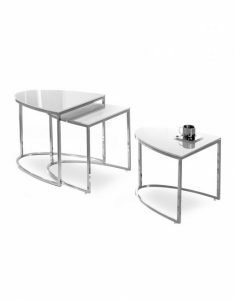 These tables come in different shapes and sizes to fit the space you want and to fit in with your decor. The design is perfect for modern decor. 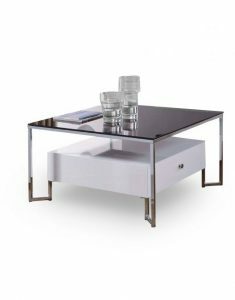 The tables have glass tops, glossy surfaces, metallic legs and simple surfaces. There are no ornate embellishments or flashy accents. The tables are sleek, sophisticated and stylish. Storage coffee tables and ottomans are very popular because they take advantage of the empty space under the table to hide typical living room clutter like remote controls, DVDs, and games. However, these traditional storage tables can be bulky and too overwhelming for some spaces. The hover coffee table with storage offers a unique design. The storage compartment is suspended below the table surface, seemingly in mid-air. Small, silver pegs hold it up and attach it to the legs of the coffee table, and these supports are barely noticeable. The design won’t hold as much as that oversized ottoman you’ve seen in so many other living rooms, but it will hold just enough to keep out the clutter while also keeping proportions smaller for a more interesting and sophisticated design. Smooth surfaces, straight lines, and neutral tones contribute to the modern aesthetic of the coffee table. Your side tables don’t have to be fixed to be useful. 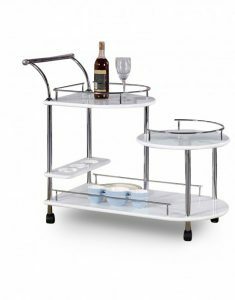 A serving cart can act as a side table while also remaining flexible thanks to its mobility. Serving carts have multiple levels for flexibility in usage. There are two tiers of top tables and a lower surface area, as well. Guard rails are attached around each surface to prevent drinks and bottles from falling off while you are moving the cart. Other carts are simpler in design with a top surface area and a bottom area. 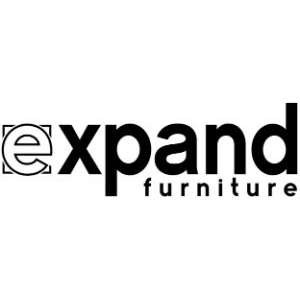 These and multiple other modern coffee and side tables are available at Expand Furniture. 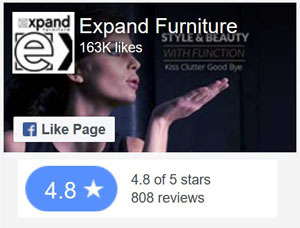 We are committed to providing the most stylish and high-quality furniture that also helps you make the best use of your space. With the right space-saving furniture, you can minimize clutter and make it feel like you have an even larger home than you do. 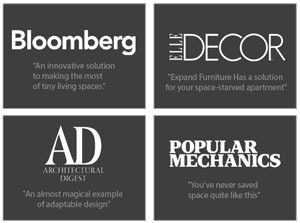 Look through our online catalog to find transforming coffee tables, modular shelving units, Murphy wall beds and more.